Little Common player-manager Russell Eldridge says the football club must stand up and be counted in a vital relegation ‘six-pointer’. Third-from-bottom Common will travel to fifth-from-bottom Loxwood in the Southern Combination League Premier Division tomorrow (Saturday), with both teams desperate to avoid dropping into the two relegation places. 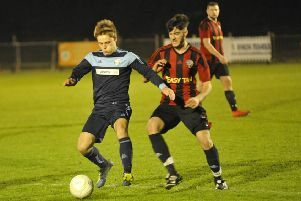 Eldridge said: “Loxwood are probably in a similar position to us because they’re on a bit of a losing streak as well. Confidence won’t be high for them either. Playing away from home might suit us a little bit. “We need to stand up and be counted, and whether it’s through passing or being more direct, whatever, we just need to find a way - it’s as simple as that. “They may think they need one more win and they will see Saturday as an opportunity to do it. We need to come away with something, a minimum of a point. “As always, we will be looking to get the three points because three points at this stage of the season is vitally important to the end outcome. “We will certainly need at least one more win and the sooner we get that win the better. It’s important we remain positive, optimistic and together throughout. Common are four points behind Loxwood, who beat them 4-1 in December’s reverse fixture, and two ahead of the two teams beneath them, Eastbourne United AFC (who have a game in hand) and Shoreham. “We’ve got to look at controlling what we can and that’s our own performance; how much we run, how much we work, our quality on the ball,” added Eldridge. “It’s all about ourselves and not worrying about anything else. “We need to get some points on the board. We’ve not won in four, which is very tough, and I think psychologically as soon as we go a goal behind, we struggle massively to lift ourselves off the ground. Liam Ward is away, but Common should otherwise be close to full strength.